The defining event of Alan Hollinghurst’s new 564-page novel, The Stranger’s Child, is a 1913 weekend visit by the young poet, Cecil Valance, to Two Acres, the almost-rural home (it’s in Middlesex, then on London’s outskirts) of his Cambridge chum, George Sawle. George is besotted with Cecil and they have already started a tentative affair. Also already besotted with Cecil, even though she has yet to meet him, is George’s 16-year-old sister Daphne. Under the trees the dusk was deeper, and their little wood seemed interestingly larger. The boys were dawdling, for all Cecil’s note of impatience. Their pale clothes, the rim of George’s boater, caught the failing light as they moved slowly between the birch-trunks, but their faces were hard to make out. George had stopped and was poking at something with his foot, Cecil, taller, standing close beside him, as if to share his view of it. She went cautiously towards them, and it took her a moment to realize that they were quite unaware of her; she stood still, smiling awkwardly, let out an anxious gasp, and then, mystified and excited, began to explore her position. She knew that Cecil was a guest and too grown-up to play a trick on, though George was surely in her power. But having the power, she couldn’t think what to do with it. Now Cecil had his hand on George’s shoulder, as if consoling him, though he was laughing too, more quietly than before; the curves of their two hats nudged and overlapped. She thought there was something nice in Cecil’s laugh, after all, a whinny of good fun, even if, as so often, she was not included in the joke. Then Cecil raised his head and saw her and said, ‘Oh, hello!’ as if they’d already met several times and enjoyed it. That is a very long quote to be ended with ‘Oh, hello!’ as its moment of dramatic conclusion, but it is chosen deliberately. Hollinghurst is sometimes Proustian in prose style and often uses hundreds of words to develop in advance observations on all the nuances of what turns out to be a seemngly prosaic conclusion when he finally gets to it. To appreciate it, you need to be able to treat every comma, semi-colon and colon as an extended word itself (also a talent that Proust requires). And you have to quickly adjust yourself to the idea that most outcomes of these flights will not be dramatic but are important in the writer’s overall scheme of things. The author uses the weekend to introduce an expansive cast of characters who will return (either themselves or their offspring or their offspring’s offspring) in the near-century of narrative that will follow in the book. This list is only a start but that includes George and Daphne’s older brother, Hubert; Harry Hewitt, the bachelor neighbor who keeps sending Hubert expensive presents (the most recent being a gramaphone); and Jonah, the young servant boy who has been conscipted as Cecil’s “valet” for the weekend. More important to the structure of the book, however, is the way that Hollinghurst uses the weekend visit to sketch the theme that will be even more central to the book than those specific characters. Cecil comes from Corley Court, a far grander estate than the modest Two Acres, and his ascending literary reputation (Daphne finds elements of Tennyson in him) is based on poems describing Corley. While there is much talk about creating poetry on the weekend — and even some carefully-staged reading — the creative discovery that will dominate the novel occurs when, after Cecil has departed, George heads upstairs in search of Daphne’s autograph album which the guest has promised to sign. ‘What is it?’ said Daphne, pushing back her chair but determined to keep her dignity, almost to seem indifferent. Not just his name, then: she could see it was much, much more — now that the book was here, open, in the room, she felt quite frightened at the thought of what might come out of it. ‘The gentleman left it in the room,’ said Jonah, looking from one to the other of them. ‘Yes, thank you,’ said Daphne. George was blinking slowly and softly biting his lower lip in concentration. He might have been pondering how to break some rather awkward news to her, as he came and sat down across from her, placing the book on the table then turning the pages back to start again. ‘Well, when you’ve finished,’ Daphne said tartly, but also with reluctant respect. What Cecil had written was poetry, which took longer to read, and his handwriting wasn’t of the clearest. The “autograph” turns out to be an extended poem, ‘Two Acres’, which both Daphne and George interpret as a love ode directed to her or him. Cecil will die in the Great War in a few years, leaving behind a slim oeuvre — ‘Two Acres’ will become a staple of English poetry anthologies and required reading for generations of students to come. While Hollinghurst skips decades and even generations as the rest of the novel develops (Daphne will marry three times, her first husband is Cecil’s younger brother), ‘Two Acres’ the poem is always present. The ‘real world’ of the novel is an exploration of the creative and academic classes of twentieth century England — the ‘creative world’ is how every person present at the weekend (and their children and grandchildren) are touched by the poem, its reputation and the way it influenced them. Their own efforts range from novels to autobiography to critical biography, but none of those works will escape the influence of the poem. As I hope that brief outline indicates, it is not just prose style that provokes comparisons with Proust. While the time frame in this novel is much longer (and the overall literary project much, much shorter), the writing tactic of using “strategic digressions” to explore in detail various people and aspects influenced by central elements is present in both works. Androgyny, homosexuality and gender-based sexual politics are another commonality. As is the sense of oppression that history and memory impose on individuals in whatever the present tense is of each section. For this reader, that is where the comparison ends. Hollinghurst won the 2004 Booker Prize for A Line of Beauty and this novel has attracted some enthusiastic reviews which proclaim The Stranger’s Child as a contender this year. It is not for me — the prose started out flat, moved on to annoying and became even more self-indulgent and tedious as the novel wore on. I like Proust (and his style) but I am afraid the characters and world that Hollinghurst portrays never came to life for me. Unable to enrol in either story or style, I found the read a difficult slog. Then again, I had similar troubles last year with Howard Jacobson’s The Finkler Question and it went on to win the Prize so maybe my taste and that of the Booker jury will diverge again this year. A note to North American readers: My copy of The Stranger’s Child was an Advanced Reading Copy from Alfred A. Knopf, not due for release in the U.S. and Canada until October — and that is the cover featured at the top of the review — so I am jumping the gun with this review because of Booker considerations. The U.K. version was released July 1 and I have included that cover. While each accurately captures an aspect of the book, my view would be that the maze of the U.K. cover is a better graphic reflection of the novel — for me, reading it was like venturing into a maze that ended up being not very interesting. Others have obviously found it more rewarding. 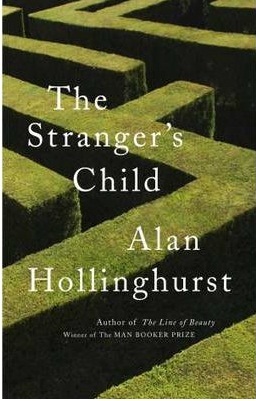 This entry was posted on July 18, 2011 at 11:55 am and is filed under Author, Hollinghurst, Alan. You can follow any responses to this entry through the RSS 2.0 feed. You can skip to the end and leave a response. Pinging is currently not allowed. Oh dear. This is my most eagerly anticipated novel of 2011; I loved A Line of Beauty and couldn’t stop thinking about it for a long time after I finished it. I found the language, more than the story, just beautiful. I’m going to read The Stranger’s Child, but now my expectations have plummeted due to your review–I tend to agree with your views on most novels. Your reviews, even when tepid, lead me into good directions. Thank you for The O’Briens, by Peter Behrens. I know Venice Beach too well, and I’ll never know Canada well enough. Thank you. Judge Bacon: Thank you very much. If you know Venice Beach from the perspective of “explorers” who have pushed as far West as they could in search of a new frontier, you will have no problem with the “Canadian” aspects of Behrens’ book. It never ceases to amaze me that you will persist with. 500+ page novel that doesnt grab you. Do you not hold the author accountable to keep you engaged on some level? Liz: While I too liked The Line of Beauty, I was perhaps a bit out of step in that it was not the language that most impressed me. Were I you, I would take that as a sign that you might not share my reaction to this novel. While the story is slim, it is not without merit — perhaps if I had been able to get into the rhythm of the prose, my reaction would have been more positive. Certainly, the reviews that I have read from people who liked this novel cited the language which was a major barrier for me. So don’t abandon hope. Sheila: An entirely legitimate question. I was looking forward to the book because of Hollinghurst’s previous novel and overall reputation. I was also aware that, despite the generally positive reviews in the commercial press (including a number of raves), a number of readers whom I respect had abandoned it — the result being that only positive reviews have been published despite the fact that some thoughtful readers found it badly wanting. It seems to me that someone who found fault with it should persist to the point of providing an explanation why. So I not only slogged through to the end (wasting a couple of days of reading time with avoidance behavior in the meantime — i.e. Royal tour coverage, etc. ), I did my best to offer a summary of the book that, while not hiding my own disappointment, might offer useful data to others who read it. i guess you cant help that presbyterian streak, but good for you for ensuring that there is balance in the reviewing world. Amen, as we say. I echo the ‘oh dear’ but I’m going to go for it anyway. My instinct to steer clear of this is confirmed Kevin. And a salute to your sense of duty! Guy, Leroy: Well, I am heartened that the review isn’t provoking major alterations in prospective reader behavior. 🙂 I do suspect that those who liked Hollinghurst more than I did last time (although I did like him, just not a rave) will be more impressed with this book than I was. And I certainly can’t find anything to tell those who are inclined to give it a pass that they are making a mistake. You’ve convinced me to give Hollinghurst a chance with “A Line of Beauty” and to wait on “The Stranger’s Child,” though it is now longlisted for the Booker prize. I am also intrigued by your challenge: if there is something wanting in his style or technique, discover it plainly and make the case. Another good review and thanks for that. It seems to me that Hollinghurst wanted the opportunity to write about several different contrasting moments in 20th century British life and the focus on Cecil Vallance’s life and poems was the device for putting this into operation. Hence we get the Edwardian house party – the most succesful section I think. Next a kind of Gosford Park pastiche complete with an unconvincing Emerald Cunard style character – for me the weakest section. Next England on the cusp of swinging changes with all its implications for gay lifesyles. As someone who was a teenager in the 60’s, Hollinghurst’s portrayal of provincial life in1967 is quite wrongfooted and sounds more typical of life in 1960. However the introduction of Paul is a bonus in this section as his character is the most richly developed. Finally we get the most modern section with a chance to satirise the world of publishing and reviewing and a nod to the changing status of gay relationships. The coda leads us into a denoument redolent of Possession as yet another newly introduced character races to rescue some letters which will reveal the final truth. It’s a very readable novel in parts and I’ve read it almost continuously over the past three days. However whereas the first section is in my opinion brilliantly written, the over ambitious nature of the whole project leads to far too many underwritten characters and a kind of frustrated feeling of disconnection as one `novella’ ends and the next one begins. There are parts of the plot that are convenient but unconvincing. Are we to believe that Dudley a scion of an immensely rich and quasi aristocratic family would really marry Daphne who is ilttle more than a dullish middle class school girl? I think Hollinghurst is a very accomplished writer and I’m pleased that he’s addressing the sweep of British history but I think the delicate writing of his first chapter could have been developed into a story that was less ambitious in scope but ultimately more satisfying for the reader. Mary: An excellent analysis, and thank you very much. For those who are contemplating reading the book, I think you hit both the high and low points. I’ve read Hollinghurst’s first two novels. I liked both well enough, but he’s an incredibly dense writer. On the level of the sentence he glitters, but at the level of the novel I can find him claustrophobic. The Line of Beauty is on my TBR list, but this isn’t. It sounds overlong and overindulgent. Hollinghurst I fear may be becoming too successful for his editors. Max: “Claustrophobic” is a good way of describing my reaction. Like Mary, I found the first section interesting (even if it has been done by a number of other writers — Hollinghurst is no Waugh as far as I am concerned). After that, for me, it was all downhill and I became more and more frustrated by the prose. In fairness, I should note that those who like the book argue that it is the language which carries the book and they feel it gets better. This would not be the first novel where what I found to be overindulgent writing was viewed by others as soaring prose — from the number of readers whom I know abandoned the book I am sure that I am not alone in my response. It was one of those novels that is not going to show many negative reviews — the commercial press is reluctant to have a go at the author (I suspect there may be a few literary journal reviews that do); bloggers who don’t like it just set it aside. Have started in on this one without reading any reviews but 40 pages in am already finding it – I don’t even know the word I want – Cecil, Daphne, and Hubertish. I shall persist for the moment, darlings. OK, that’s it, I’ve given up. Bloodless, irritating characters; wandering and unnecessary descriptive passages. Tedium. Kevin, how can you even mention Proust in the same sentence?! That will take some forgiving. Sazerac: I duly consider myself appropriately whipped with the proverbial wet noodle for comparing Hollinghurst to Proust. It didn’t hurt, but the humiliation is quite painful nonetheless. In my totally unacceptable defence, I’d offer the excuse that I was trying to find a reason why some people have raved about this book. I would suggest that your response has tended to validate my thesis: there are few negative reviews of this novel because those who don’t like it simply abandon it. And there are a lot of people who have done just that. On the speculation side, I would not be surprised at all to see this one missing from the “real jury” shortlist. The longlist indicates a tilt toward books with a fair bit of “action” — this volume certainly does not fit that model. Yes, I thought you might be trying to do the decent thing and find a reason for the ravings about this book. Perhaps the word ‘ravings’ says it all. Do you think that the leanings towards ‘action’ have anything to do with the MI5/6 connection this year? I am so disappointed to see this book not making it to the shortlist of the Booker list. The language is so delicious, Proust-like, as you had rightly pointed out. Oh well. We must be reading different Prousts. Or Hollinghursts.